What is SEO? Inside Secrets How Search Engine Optimization works and ways beginners, intermediate, and advanced marketers - you - can use SEO to improve your keyword rankings, increase website traffic, and the number of leads for your business. Search Engine Optimization (“SEO”) explained for digital marketers, business owners, and beginners who want learn how to optimize websites for higher rankings and traffic. Inside Secrets On How “SEO” Can Increase Your Website Traffic, Your Lead Conversions, and Help You Rank Higher on Search Engines. Want to learn “What is SEO?” Well, good news is that we cover everything about SEO, also known as Search Engine Optimization in this article and explain every resource you need to know: from beginners, intermediate, to advanced marketers, who want to optimize their website for higher search engine rankings (SERP) and increased website traffic. If you could rank on the first page of Google for every term keyword, how valuable would that be for your business? On average, the first link on Google will generate 7 times more revenue than links beneath it. That would be a game-changing, right? If every time a customer searched for keywords related to your business, they found your site, you could reasonably expect tons more traffic, more leads, and more sales. And that’s a fact. About one-half of all clicks in search results go to the top three pages. By Page 2, the number of clicks falls to less than 1 percent. In other words, if you aren’t on Page 1 of Google, you are out of luck. But here’s the problem: For most, earning that coveted Page 1 ranking seems like magic. You either get it, or you don’t. What if there was a secret to earning more traffic? Well, there is. In a buzzword, it’s SEO, or search engine optimization. The Definition of “SEO”: Search Engine Optimization is the process of optimizing your website to gain higher rankings on search engine results pages (SERPs). Using SEO strategies, you make it easier for search engines like Google to understand the relevancy of your content and how your website relates to users’ searches. Think of it like this: Google is a giant recommendation engine. It wants to serve users the best, most relevant pages. Without optimization, your website is like a book with no cover, no title page and no blurbs from critics telling you it’s a page-turner. Google has no reason to think your website is great, or relevant, or useful. With SEO, you are effectively filling in all that data. You are adding a cover, you are adding social proof from critics, you’re providing a synopsis. In other words, SEO allows you to tell search engines why and to whom your site matters. That’s great, you say! SEO can be super helpful. But you how do you actually go about earning those higher rankings? There’s a lot unpack in understanding how SEO works. But we’ll do our best in this guide on what SEO is and how you can optimize your business rankings. We’ve broken it down into some helpful categories. So, What is SEO and How Does it Work? How SEO Works - Examples to learn “what is seo” and how to optimize your websites. You type in a search for “gluten-free recipes” and BAM! Google displays the most relevant sites. How is it possible that Google’s algorithm knows what to rank #1? After all, according to NetCraft there are 1.8 billion websites in the world. To understand how that works, it’s helpful to take a step back and look at how Google finds websites and what criteria they use to rank sites. Once you understand how it works, you can begin to use SEO to start improving your website’s visibility across all search engines. SEO Bonus: When you optimize your website for search engine rankings is that you inevitably will design a more user-friendly website that helps you convert more leads and drive more website traffic to your business. Google uses an army of “robots”– really just pieces of software based on Google’s “PageRank” algorithm, not the Boston Dynamics variety – that “crawls” and “indexes” the entire web. At some time or another, these web crawlers (“spiders”) will access your website, scan what’s on the page, and then file it away in a massive filing cabinet. The organic ranking of your website begins when it is crawled. Those robots don’t just scan pages; they also determining what information is on the page, how that information relates to users’ search terms, and how trustworthy the information is, among other criteria. So, when you type in “gluten-free recipes,” Google looks for the exact pages that have the most ranking signals that align with your search intent. And SEO is the process of improving your website around these key ranking signals. B) and why your website content deserves a Page 1 rank. And the result for all your efforts? Your site earns more and higher quality traffic. What are Ranking Signals, and Why do they Matter? Search Engine Ranking signals. We talked about them a little. But what are they exactly? And why do they matter? Ranking signals – or rank factors, as they’re often called – are bits of information Google uses to determine where and to whom to show your website. By optimizing around these signals (there are hundreds of them), you make your website more complete and help search engines see how it relates to search terms. The majority of ranking signals can be broken down into four categories, and there are SEO strategies for improving each area. Google wants to send users to quality websites. If they started recommending spammy, slow-loading or horribly designed sites, users would abandon ship! Technical SEO refers to optimizing for performance and security; you improve user experience (UX), security, organization, loading speeds, and ensure your website looks good on a mobile screen. The pages and articles on your site compete with thousands of others websites. On-Page SEO allows you to define the focus of each page and show Google who each page is relevant to, what’s included on the page, and how it’s unique and useful. On-page SEO is the process of optimizing site content to be as relevant, trustworthy and helpful as possible; this includes improving images, text, keyword usage, metadata, etc. to give search engines clues about what’s on each page. Google values word-of-mouth recommendations. But online, that doesn’t mean hearing from a friend that a restaurant serves great sticky buns. Things like inbound links, social media mentions, directory listings, and more can help you show Google that your site has a good reputation. Off-page, or off-site, SEO refers to improving these signals. Today, we use Google like it’s the phone book. We want to find businesses nearby that have, or serve, or sell what we want. Local SEO allows website owners where its physical location is in proximity to a searcher. Strategies include adding a Google My Business profile, getting citations, building profiles on review sites, local mentions, and more. A Quick Summary: Google and other search engines use hundreds of ranking signals to determine page rank. These signals fall into four categories: Local, On-Page, Off-Page and Technical. When you optimize your website to rank higher on search engines, you’re adding more data in each of these categories. That helps Google and other search engines know what’s on your website, and why and to whom it matters most. Without great SEO, your website is a book without a cover. But there are key strategies in each category that can improve your rankings. Effective SEO is, to a large extent, all about focusing on optimizing for the most useful ranking signals. OK, so you have an idea of how SEO works. But how do you get started? What matters most in Google’s algorithms? Not all ranking signals are created equal. Some are more valuable than others. But there are several that offer website owners the most bang for their buck. 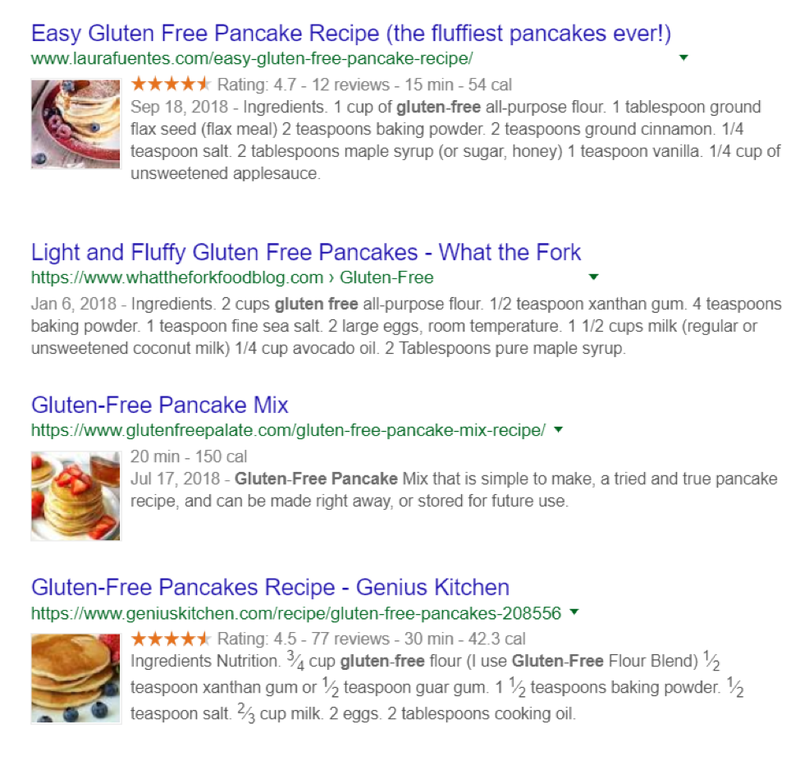 We’ve also provided some examples, comparing the #1 and #4 results from our “gluten-free pancake” search. 1. Obtain Strong Backlinks from Reputable Sources. In other words, links tell search engines that your website is useful, credible and relevant. Almost all links are great, if you’re receiving them naturally. But quality links are best. If a media source is writing about and linking to your website, a so-called “editorial link,” that’s one of the most valuable types of backlinks you can earn. Pro SEO Tip: We recommend that you go to our Best SEO Tools list to determine the best ways how you can obtain quality backlinks to your website. The content on your website is one of the most powerful tools you have to improve ranking. Quality content – content that’s useful, informative, credible, relevant, and engaging – is what users want. But first, key questions and answers to know about what makes quality content that can help you rank higher on search engines…. What is the best word count/length for your website pages? You should aim for 3,000+ words of quality written content. If your business is in a very competitive niche or industry, the more words, the better. For example, if your company is in the medical industry, let’s say Dermatology, which is a very competitive niche… you want to make sure you spend more time optimizing every page and adding as much original, focused content as possible. What are the best keywords to choose for your SEO campaigns? The Vail Networks team recommends you optimize around 25 to 50 keywords (short, medium, and long-tail keywords) that represent your industry the best. For example, if you own a law firm and want to run an SEO campaign that optimizes your website to rank #1 in your specialty, brainstorm what types of search terms your audience will be looking for (examples: Securities Law Firm, Personal Injury Firm, Criminal Law Firm) and use a root keyword to get started such as Securities Lawyer, and then add the State location, e.g. Securities Lawyer Texas. The same example can be written about a Personal Injury Attorney, by adding Personal Injury Attorney Colorado (just an example). But at the very least, you want to rank #1 for the industry - from medicine to law, and beyond - not just on the primary keyword, but also based on your location… wherever you are in the United States. Should you put “alt text” data on your images and photos? Yes. Always add a simple description to your images and photos to help Google know exactly what your article is referring to and whether or not the image is relevant for a specific audience. Can videos help with SEO and improve search engine rankings (SERP)? Yes, if done properly. The Vail Networks team recommends that you create simple explainer videos and tutorials that help make your content higher quality. 3. Build a Website with the Best UI/UX = User Interface and User Experience. The user experience of your website should be thoughtful. It should be easy to find information, to navigate to other pages, and to read content on the page. Google uses some key UX metrics to help it understand how users interact with your site. For example, a high bounce rate – which is the number of visitors that leave after viewing a single page – is indicative of poor UX. Slow load speeds are common indicators of poor UX. 4. Use Quality Keywords That Matter. 5. Build a Mobile Friendly Website. How to build a mobile-friendly website. We’re using mobile devices to browse the web more and more. And Google and other search engines have taken note. That’s why mobile friendliness or mobile UX is taking a more prominent role in ranking. Your focus should be on the elements of great mobile UX: properly sized pages, fast-loading content, no pop-ups, larger buttons, etc. This can be accomplished using a responsive website, which shrinks your site based on the user’s device. Ultimately, it’s not enough to have just a desktop site. If you haven’t gone mobile, your search engine rankings are in trouble. Now’s the time to do something productive… let’s start with our Ultimate “Mobile-Friendly Website Checklist below. Is your website text easy to read and accessible for all eyes? Do you pages load fast, defined as less than 1 second? Are you buttons the right size, or are they too small or too big? Can your website pass Google’s Mobile Friendliness Test? Are you avoiding interstitials, aka “Pop-Up welcome messages”? Are you using a Mobile Friendly Configuration (Responsive Design or Dynamic Serving)? Does your content work? Meaning it’s cross-browser compatible? How METADATA WORKS FOR SEO. Metadata is a key on-page SEO element, while schema markup is a newer form of metadata. Both are information tidbits that you add to your website’s code that provide information about who you are, how you’re relevant to users, and what type of content is on the page. A few examples of metadata include the page title tag and meta description. Page title – the title that appears in search results – is one of the most important on-page elements. A strong title encourages clicks and engages visitors. HOW SCHEMA MARKUPS HELP WITH SEO. Schema markup, on the other hand, is informational data your business – e.g. address, phone number, reviews, the type of business you are, hours of operation. If you’ve ever seen star-ratings in search results, those were surfaced thanks to schema markup. 7. Get More Social Media Likes and Comments. Social media has an increasingly importance to SEO. The reason? More popular, relevant and useful websites are most likely to be mentioned and talked about on social media. This can include links to your site through retweets, a greater percentage of traffic flow from social media, or an increase in shares, likes or followers. As you can notice in the following example, when two sites in a similar industry publish an article about a topic, the one with more total social media likes, comments, retweets, and general user engagement, will often rank higher than their competitor. HOW SOCIAL MEDIA ENGAGEMENT (Likes, Comments and DIScussion) IMPACTS SEO. 8. Measure How Engaged Your Users Are With Your Website. One way that Google calculates the usefulness of content is by looking at engagement metrics. This includes things like the average time spent on page, the click-through rate of a page, and the number of pages a user visits when they click-through to your site. Creating quality content is one of the fastest ways to improve engagement, and enhancing UX or adding internal linking can help as well. SEO Formula: Longer Visits + Higher Click Throughs = Better SERP Rankings. When users spend more time on your website, this means they aren’t bouncing or jumping off your pages. This indicates to Google that there is solid engagement and low bounce rates. Thus, you can improve your SEO by engaging users more. This goes back to why it’s so important to write quality content and optimize around your audience demographic. 9. Collect Accurate NAP Citations. Yes, directory submissions can help with SEO. Citations are one of the most important elements of local and off-site SEO. NAP stands for Name, Address, Phone Number, and includes listings for your website/business in online directories, review sites, social media pages, and forums. The key is consistency. The more consistent NAP citations your website has, the more credible it is in the eyes of search engines. Of course, there are dozens of elements that affect your site’s search engine optimization. But as you build an SEO strategy, start with these elements for the best results. How long will it take for your SEO efforts and strategies to work? Let’s say you just launched your website. You optimized for all those important ranking factors. You should shoot up to No. 1, right? Short-term vs. long-term seo strategies. Well, no. That’s not likely… right away. SEO is a long-term marketing strategy. And although optimization will certainly help you outperform non-optimized websites, you shouldn’t count on earning Page 1 rankings immediately. The reason is that trust and inbound links play such a huge part in Google’s algorithm, and both take months of effort to earn. Plus, Google’s indexing robots may have trouble finding your website or individual pages on your site. But ultimately, for a just-launched website or an existing site that was optimized, SEO strategies usually take at least 6 months, and often range between 18 to 24 months for proper optimization. Remember, though, that the results don’t happen all at once; a steady uptick in traffic and rank is much more common than an overnight success. Fortunately, SEO results tend to improve over time. As you earn more backlinks, build up a library of rich content, and refine your off-site marketing efforts, you can begin to expect stronger results. Once pages start to rank, you’ll see more and more pages continue to improve. And, as long as you pay attention to Google updates and continue to refine and improve, you can keep these fought-for rankings for many years to come. What’s the difference and why they matter? But I want results right now, you say. Is there a faster way to increase my search rankings? Black hat seo vs. white-hat seo. In the not too distant past, Google’s algorithm wasn’t all that sophisticated. You could “keyword stuff” a page and earn a Page 1 result. Just say “gluten-free recipes” the most times on the page. And voila! You were an overnight success. Keyword stuffing – although it’s not widely used anymore – is an example of black hat SEO. “Black Hat” SEO: any tactic or technique designed to “game” search engine results. Often, these strategies are aggressive and shady, and used for quick returns. For example, linking schemes, in which you buy thousands of inbound links, is a form of black hat SEO. Article spinning, deceptive redirects, and doorway pages are a few other examples. Here’s the problem: Many black hat SEO strategies violate Google’s terms of service. That means any traffic gains are temporary. Google will eventually catch on, delist pages and take away rank. In other words, it’s important to stick with only white hat SEO strategies. “White at” SEO: any tactic that complies with a search engine’s terms of service. These are search engine optimization best practices, and they’re the key to long-term rankings. Ultimately, when you seek an SEO services for your business, you should ask about results and the methods the firm uses to get them. Any promises of quick returns are often too good to be true. Instead, if you want to see real results, plan for the long-term. Here’s a great analogy: SEO is like an advertisement that keeps on giving. When you purchase a print ad, it runs for a week or a couple of months, and then it’s gone. With SEO, you’re working on a marketing strategy that takes time initially, but that can generate business for years. There is no doubt that high-quality content matters. Content – e.g. photos, videos, text, infographics – is the single greatest tool in the search engine optimizer’s toolkit. Why? Well, for starters, content is what users see when they click through on the SERP. And remember, Google only wants to show users the best. Therefore, if you’re writing content that search engines deem valuable and high-quality, you have a leg up on the competition. And it matters. In fact, according to a Moz study of local search ranking factors, volume of quality content on an entire website is one of the most important factors in ranking. How to write high quality seo content. Google provides some quality content guidelines in its Webmaster Academy. One key: focus your content on users. Answer their questions, provide a great UX, and link out to your sources. It’s really that simple. If what you are producing is unique, helpful, and easy-to-read, you’re hitting it out of the park. Plagiarism doesn’t work. You can’t steal content and expect to rank. And you can’t just spin content that already exists online, adding just enough originality. To be successful, your content must be 100% original. Use a tool like Copyscape to check if you’re totally unique. How to write the best content for seo. Provide the information that a user is looking for… and then some. Answer their questions fully. But also, anticipate other questions that might pop into the user’s mind. Build comprehensive guides and how-tos on your blog. On service pages, focus on answering key customer questions about the service, costs, booking appointments and what to expect. Although word count isn’t the greatest indicator of quality, longer content tends to perform better for a few reasons. For one, longer articles typically include more information, i.e. they’re more useful. Secondly, people tend to be more engaged and spend longer times on the page when you have written more content that is relevant to users. Pro SEO Tip: Make your articles 3,000 words or longer. Search Engine Research shows the top 3 results are 45% longer on average than the 20th ranked link. Trust is a big indicator of quality. And you can convey credibility in a few ways. For one, link to quality sources. You might not think that linking off of your site is a good idea. But for search engines, this is a strong indicator of trust and valuable information. Second, make it easy for people to find information about your business, e.g. social media pages, phone numbers/address, etc. You don’t want visitors to feel like they’ve entered a black hole. You might be wondering: How does Google calculate if people actually like a piece of content? Well, there are two ways, and as you optimize your existing content you should look into improving these metrics. They are: “time on page” and “click-through rate in SERPs.” If more people click on your links in search results, that’s a good indicator that the page is well-aligned to a user’s query. And the more time people spend reading your content, the better. To improve both, focus on writing things people want to read! The value of quality content can’t be over-expressed. Great websites have tons and tons of it. So, whether you’re launching a new website, or you’re refreshing an existing site, focus on refining and improving the content. Add to it and make it more robust. Increase its credibility with links and a great UX. Generate backlinks by asking other bloggers to link to it. And make sure it’s something that people want to spend a few minutes reading. Hopefully, by now you have a strong idea of what SEO is and how it works. Now, the fun part begins! You can begin applying some of these principles to generate more traffic. But where should you begin your search engine optimization strategies? These areas represent low-hanging fruit. They’re relatively easy SEO strategies that can have a significant impact on traffic and rankings. Explore your website’s pages and old blog posts. Expand titles that aren’t receiving much traffic – shoot for 2,000+ words – and optimize each piece of content for targeted keywords. You can also improve titles to be more compelling, add images, fix broken links, and add internal links. All too often we see websites that have completely neglected to write metadata. Their images don’t have alt-tags, their titles aren’t descriptive, and their pages are missing meta descriptions. Fill in this data for a quick SEO win. Widely shared content = highly ranked content. If you maximize shares, you can expect upticks in ranking. So, revise and update content to make it more shareable. Add social media buttons to every article, create a social marketing plan for your content or homepage, and focus on making content more fun and engaging. Generating backlinks isn’t easy or quick. But since it can have the most powerful effect on ranking, it’s something every website should be doing. One strategy: Ask. Look for website and blogs in your niche and see if they’d like to link to your most valuable guides or articles. Adding richer, more helpful links to your pages can have an immediate effect on rank. Start by examining your most popular pages, and provide links to other relevant content that visitors might like. As a rule of thumb: Interior pages should have at least 2-3 internal links. Are two pieces of content on your site competing? This is known as keyword cannibalization. The result is often two mediocre performing pieces, rather than one that’s doing great. A quick fix, combine articles and 301 redirect the low-performing of the two. If you’re a business that relies on local customers, you need to start optimizing for local search. First, build Google My Business and Bing Places profiles. Then, submit your site to local directories for NAP citations. Finally, add geo-modifier keywords to your pages for an added boost. And of course, get help with your Search Engine Optimization from Vail Networks. If there’s one thing that works in SEO it’s continual testing and innovation. The truth is Google, Bing and Yahoo constantly update their algorithms. When new technologies appear, search engines are the first to respond. Just look at how important mobile friendliness is nowadays. A website that might have ranked highly a few years ago, but neglected its mobile site, probably isn’t doing so hot. In short, SEO isn’t something you set and forget. On average, most SEO campaigns to help your website achieve top rankings require between 18 to 24 months of technical SEO, on-page optimization, and high-quality content writing. The good news is that if you are searching for ways to improve your SEO, you can get in touch with Vail Networks’ SEO for Business Team. You’ll need to keep planning, stay up with trends, and continually refine and improve your website’s content. But if you can do that, it can be more of the most effective marketing channels for businesses of all types. If you have any questions about how to start ranking higher on search engines, our dedicated team is here and ready to help you with everything from website design and development, online reputation management, to SEO services for businesses. If you find this guide on “What is SEO” and How it Works helpful, share it with your colleagues, friends, and anyone who needs digital marketing consulting. You can link to the article above on your website, but please add an attribution to VailNetworks.com.